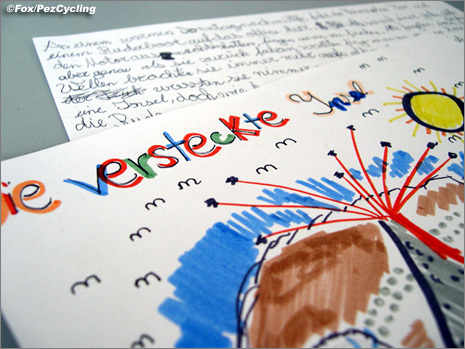 For Father's Day last year, I wrote about introducing my daughter to cycling. This year, her brother, aka my Cheapo Style Editor, joins us for a Top Ride and a bit of nostalgia along South Tyrol’s Weinstrasse, which is featured as the final stage in this year’s Giro delle Dolomiti. Well dressed kids ready to roll. I turned 40 last week [exhale… deep breath] and until this moment have been managing potentially dispiriting moments by suppressing all thoughts whatsoever concerning my age. But it's over with now because today's Ride is one of my birthday presents and writing it up entails certain unavoidable self-confrontations. Another cherished gift was an original story written by my son, titled “The Hidden Island”. It’s actually called “Die versteckte Insel”, but that’s what you get with kids growing up in German speaking Italy. The story goes like this: while on vacation, we are shipwrecked on a barren island, catch a leprechaun and he gives us each a wish. My highly teenaged daughter wishes that all of us get fancy new clothes, their half brother, quite the Capitalist, wants the coolest yacht in the world, the practical author (and first person narrator) wishes that the island becomes a paradise "like in the movies" while I merely ask for "a peaceful place to rest." While we stop right here for a moment to reflect on the insightful poignancy of his tale, a parallel one begins today. him: so who's your favorite musician? me: oh I don't know, maybe The Clash or The Smiths? him: no, I'm mean still living, you know like Robbie Williams or Lady Gaga? 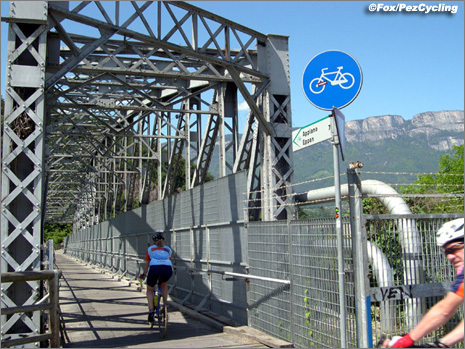 Crossing this symbolically rich bridge signals the climb to Eppan. Today is Sunday and I've been looking forward to this for quite awhile. My enthusiasm probably adds to the kids' apathy. They're at that age where they are instinctively wary of Dad's ideas, especially the ones that really excite him. Getting them jump started and the girl out of bed is the first challenge because they've been briefed. 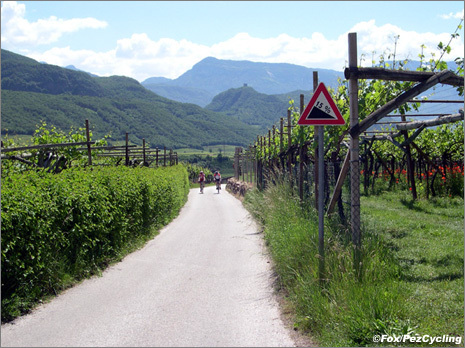 Today's ride is about 50 kilometers – from Bolzano along the Weinstrasse (or Wine Road where a lot of fine wine is produced) to Auer, encompassing a good climb and a tricky descent. It's long for them, but a One Ride with Dad Gift is a gift, right? I'm not sure why, but riding racing bikes requires epic-ness, a 5k trot around the town just wouldn’t scratch any itch. This is one of the hardest parts of the climb with a 7% pitch and no shade. Tire pressures are checked, we’re all kitted in Team Pez and ready to roll. 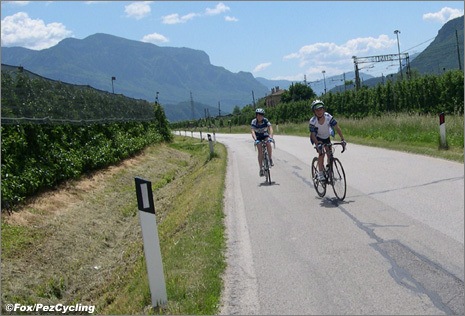 The first few kilometers out of Bolzano are easy, stretch the legs, spin and warm up ones. The boy attacks and tries to get us to chase him, but we don't bite. Save your energy. The biggest challenge of the day, a 7 kilometer climb up to Eppan, is soon upon us. 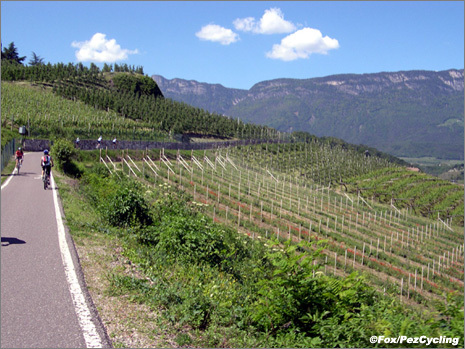 Our affluent, semi-autonomous region has thoughtfully constructed a bike path that meanders though vineyards and apple orchards and forests and through tunnels and up, up to Eppan. Nice consolations for one’s effort. There are a couple of spikes where the gradient must be around 7%, but for the most part it stays at a steady 4 - 5%. Others have the same idea as us, the bike path hasn’t seen this much activity in awhile. 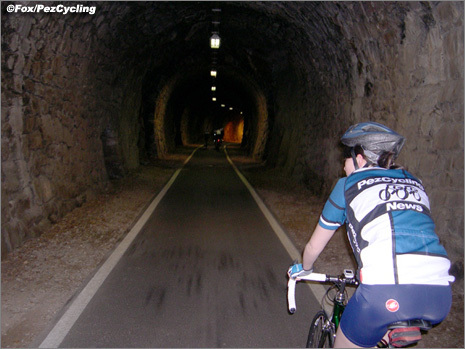 Tunnels with lights are a nice touch, thanks. Today is the first ride for my daughter on a new (old) bike. In the past year and a half she's grown more than 15 centimeters, her mother’s shoes now fit. Other changes include wearing braces, rolling her eyes often and being upset with her curfew. So all things considered, the 50cm Moser had to be duly traded and upgraded for a gorgeous 53cm De Rosa SLX. Bearing in mind that the Style Editor rides a groovy (how else could one describe a purple, orange and gray) Look KG76 also from the early 90's, it's easy to conclude that their father's musical AND cycling tastes are stuck in the past (I reckon about 20 years). Another example of this article interfering with my strategy of denial. 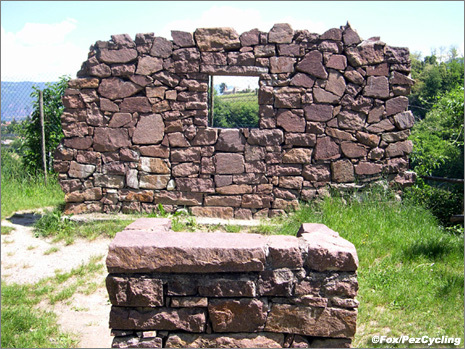 An artist’s sculpture that frames the view for you. Nice form through the forests! 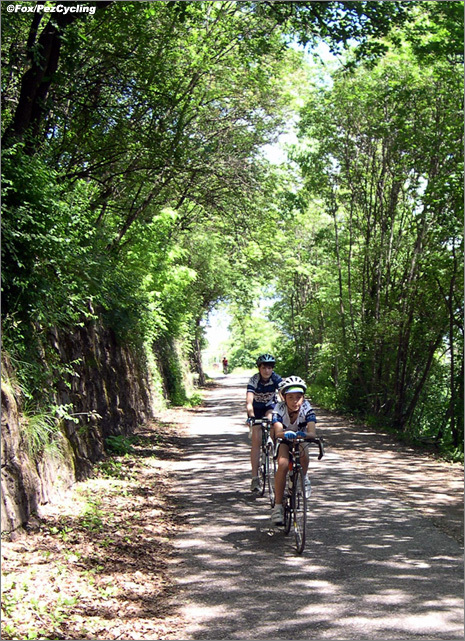 In Eppan, we follow the bike path for another 3 or 4 kilometers on a plateau of sorts. It meanders through farms and forests and every now and then opens up to brilliant views. Mountains rusty brown and purple rise from fleshy greens. This is our Cima Coppi: Kaltern. We hit the main road for a quick descent. My 11 year old tucks in, sitting on the top tube like a Pro, as we approach speeds of 50km/h. This alarms me slightly because I was kind of reckless at his age (just ask my Mom, the running joke was that we furnished the orthopedist’s waiting room). Yet I’m also envious, so I don’t say anything. In any case, it’s better than the position where he hangs his rear over the back wheel, learned from Danilo Di Luca. I get another smile: while my girl is very much on the careful side of the personality ledger, she also descends with aplomb. Proud Father Moment - see how very little a cyclist needs to be truly happy; thousands of dollars worth of bikes and speed. 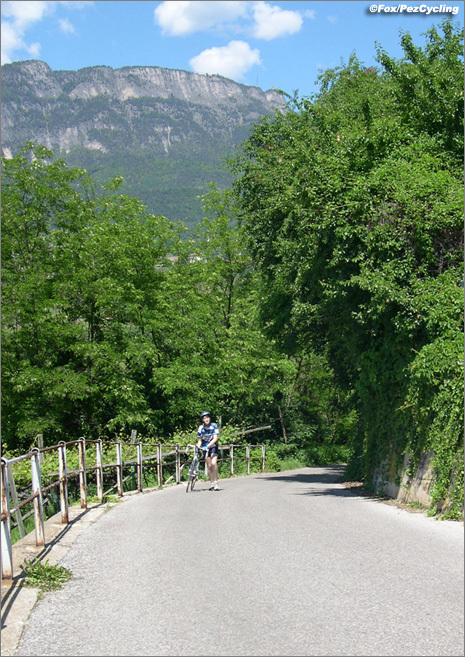 Turning off the main road, watch out for the steep drops. Now a jot around Lake Kalterer. 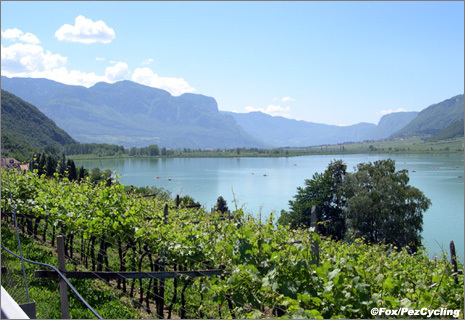 We turn off the main road and ride around the eastern side of Lake Kalterer. This farming access road has little traffic, but some mean sections that hit grades of 15%, luckily most of them are descended – man, the De Rosa’s Delta brakes are squealing bad. However, there is a 100 meter wall that’s about 18% steep. The boy and I hit it hard and wait at the top catching our breath for Miss Aplomb. She’s walking and frowning. He’s about to make fun of her, but I quickly remind him that this is the first time in 3 tries that he hasn’t walked up himself. We ride around the lake, paddle boats dot the smooth surface. A bright sun puts a white filter on everything. Turn towards Auer and a few hundred meters later we’re at Viktor’s Imbiss – a deluxe hot dog stand. It’s open everyday until 11pm, unheard of service in South Tyrol. The food is good and cheap, also a rarity here. 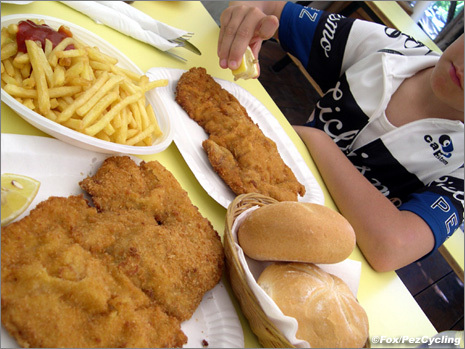 Wienerschnitzels and fries all around. Afterwards with bellies full of fat, we trudge over the bridge that crosses the Adige river. It also shields a Gypsy village built from shipping containers and besieged with satellite dishes. We barely make it to the picnic rest area on the other side and settle down for a little rest. Too much lunch on a hot day. 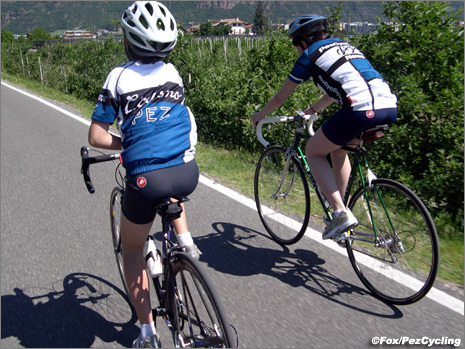 Even though we ride along the flat river valley back to Bolzano, it’s a slog home. The boy keeps attacking, finally I decide to take him up on his challenge as we approach the town of Branzoll. Odd how in all sports, in all countries kids do play by play as heard on the TV where they serve as their own heroes. My son starts, “Garzelli eyes up Cavendish, he REALLY thinks he can take him in the sprint.” I’m always the old cagey guys like Rebellin [not anymore, note to dopers: cheating gets one quickly forgotten by kids] and he’s always the young studs like Farrar. Well today in fact, the King of Corones does take The Dish at the town sign and keeps his wienerschnitzel down too! I feel very much the same about today, but hold the ice cream. I’d like to wish everyone a Happy Father’s Day, especially my own. Thanks for everything, Dad!